Do you have a story about diabetes to help or encourage others? Whatever your story and experience, we would be delighted to hear from you. These are stories of people from all walks of life. Each one is there to inspire, to highlight different aspects of living with or being affected by diabetes, or simply to show that – whatever your situation – you're not alone. Growing up in a big household, every day was a feast for Shivali Modha. Sue Briggs, 63, lives in South West England with her husband Jeremy. Sandeep, 39, was diagnosed with Type 2 diabetes in 2015 after suffering with several urinary tract infections. 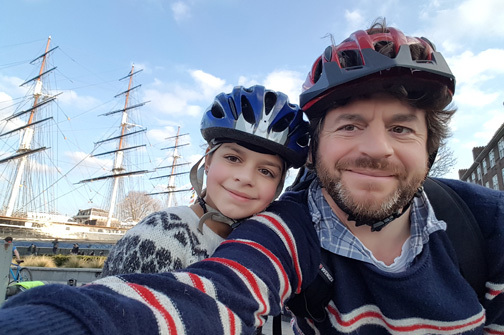 Gareth, 39, rebelled against his diabetes diagnosis as a teenager, but since the birth of his son 10 years ago, he’s put his health first and has gone on to run two marathons for Diabetes UK. Rachel is taking on the London Landmarks Half Marathon this March in memory of her Dad who passed away just over 12 months ago. Mim is currently a student working on a PhD in social work. Edward has been retired for just over five years. Joe, 58, is based in Glasgow, where he works for BT. When Kathleen, 66, was diagnosed with Type 2 diabetes, she didn't show any signs of having the condition, but already had high blood pressure and high cholesterol. Growing up in a big household, every day was a feast for Shivali Modha. Her identity was bound up with her love of food, until a struggle with diabetes gave her a new appetite for life. "The main incentive is remission, but it’s the daily reminders of how fabulously they are doing that give people a nudge to keep going." Karen, 49, didn't realise the seriousness of Type 2 when she was diagnosed at 39. As a result, her weight continued to spiral and even small cuts took a long time to heal. Sue Briggs, 63, lives in South West England with her husband Jeremy. She was diagnosed with Type 1 diabetes 10 years ago.